V–Noni is a 100% natural supplement used improve heart functions and boost your energy. 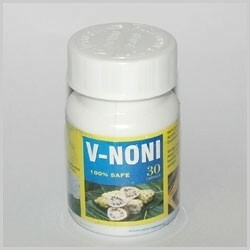 V–Noni is taken as directed by your doctor. Do not take V–Noni without consulting your doctor first if you are pregnant or breastfeeding. Consult your physician before using if you are taking any other dietary supplements or drugs. Take the missed dose of V–Noni as soon as you remember. However, if it is almost time for your next dose, skip the missed dose and take only your next regularly scheduled dose. Do not take a double dose of V–Noni. V–Noni does not have any known side effects. Store at room temperature. Keep away from children. Seek emergency medical attention in case of overdose.